One year ago, the playlist on San Diego native Kyle Vaughn's iPod featured an eclectic collection of country, alt-rock, R&B, electronica and what he called "chill-out ultralounge beats." These days, there's a little Elvis Presley in the mix. "I like Elvis' music. There's a lot of passion in the way he sings," said Vaughn, who's gotten quite familiar with the King's music since joining the "All Shook Up" tour last fall. The jukebox musical, featuring many of Presley's greatest hits, arrives June 26 at the San Diego Civic Theatre. Directed by Christopher Ashley (the incoming artistic director of La Jolla Playhouse) and with a book by Joe DiPietro (which draws heavily from Shakespeare's "A Midsummer Night's Dream" and "Twelfth Night" for its plot twists), "All Shook Up" is the story of an Elvis-like roustabout who rides a motorcycle into a quiet, 1950s Midwestern town and turns it upside down. Joe Mandragona stars as the pompadoured singer Chad, and Las Vegas veteran Susan Anton co-stars as the town's museum director. The score includes Elvis hits including "Heartbreak Hotel," "Burning Love," "Jailhouse Rock," "Blue Suede Shoes" and "Don't Be Cruel." Vaughn is a member of the show's ensemble and is Mandragona's understudy for the role of Chad (Vaughn hasn't gone on yet as Chad, but he's hoping to soon). 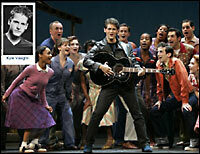 He joined the inaugural touring company in its pre-production stages last July, and the tour hit the road in September. From a tour stop in Arizona on Monday, Vaughn answered a few questions about "All Shook Up." Q: Tell me a little about your local roots. A: I grew up in the Del Cerro area of San Diego and went to the School of Creative and Performing Arts. I got started in theater when I was 8 years old and did Christian Youth Theatre summer camps and San Diego Junior Theatre. I started working professionally in my senior year of high school and just went straight into my career, and it's turned out pretty well. Q: Where is home base for you now? A: I'm bicoastal. I have an apartment I'm subletting in New York, but I fly home to San Diego on all my tour breaks. Even though I've been in New York for five years, I've only lived there for three because the other two years I've been on the road, one year with "Fame, the Musical" and now one year with "All Shook Up." Q: Which of the two tours have you enjoyed the most? A: They're both really different. "All Shook Up" is a fun, high-energy show, but "Fame" was about the students at a performing arts high school, which was something I could really relate to personally. Q: What's life like for you on the road? A: Touring is hard. It's tough living out of a suitcase and moving constantly, but I can't complain too much because I get to sing and dance at the end of the day, and you can't be upset about that. And over time, the touring company has molded into a family. I have some close friends on the tour, and we can all relate to each other because we're all dealing with the same sorts of issues and problems. Like over the weekend, we all went on a tubing trip down the Salt River and the scenery was incredible. Q: How have audiences been responding to the show on tour? A: We've gotten really good reactions from audiences. We get standing ovations at about 80 percent of our shows and really good houses. We get audiences of all ages, too. The matinees are mostly gray-haired, but we get kids, teenagers, couples and families. Everyone can relate to it and the music is great. Q: When you're not touring, what other hobbies do you pursue? A: I love shopping, music and going to the beach. I wakeboard, surf and go Boogie-Boarding. I'm really excited about coming to San Diego next week because my parents have rented a beach house and I'll get to stay on the beach while I'm out there.